KRISTIE LUI examines works from Hyon Gyon’s solo exhibition at the Parasol Unit Foundation for Contemporary Art. Scorched holes in fabric reveal layers of burnt turpentine in Hyon Gyon’s thick impasto paint. Her subjects are abstract and emotional. They manifest in an explosive portrayal of energy which combines the use of Korean textiles, Japanese paper, and haunting symbolism. Hyon Gyon, Aching Soul, 2017, mixed media on canvas. Image credit: © Hyon Gyon and Shin Gallery. Hyon Gyon is a South Korean painter who received her doctorate from the Kyoto City University of Fine Arts, before going on to practice in New York City in 2013 where she began her indefinite residency. Encompassing two floors in the minimalist space at London’s Parasol Unit Foundation for Contemporary Art, her work comprises of both two and three-dimensional artworks. Gyon’s compositions produce colourful motifs of spirits and demons proliferating ceaselessly across an abstract background. 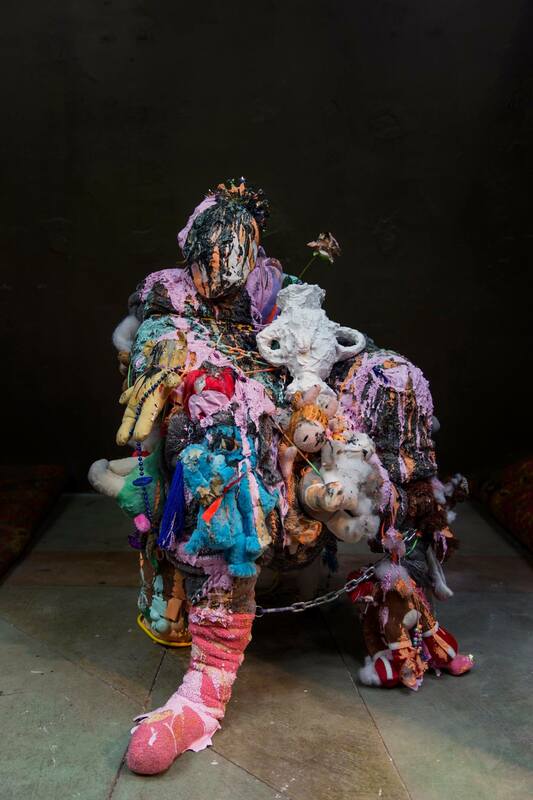 Her works often bridge imageries of the spirit world of Korean or Japanese shamanism, with the human world represented through material objects. To Hyon Gyon, the practice of art is witty and therapeutic. Creating different worlds in order to understand the ritualistic performances of shamanism is a driving force in her creative process. Her exploration of these mythical symbols is a platform through which she muses about a supernatural afterlife. The expressive visages are passionate and invigorating; they appear to burst forth from the canvas into our reality. Gyon’s work draws from deeply personal events, yet she also invites the viewer to immerse themselves in the colourful worlds she renders in her paintings. Hyon Gyon, Flame, 2010. Acrylic and Japanese paper on panel, 225 x 360 cm. Image credit: © Hyon Gyon and Parasol Unit Foundation for Contemporary Art. What I experienced was the process of purification of the negative emotions that accompany human tragedies (…) The experience had a profound effect on me as both an individual and an artist. I felt that I had at last found my subject matter. Hello! Another Me, as well as another exhibited painting, Flame, seems to encompass the amalgamation of these emotions, tying shamanistic imagery of death with pure, untainted colours referencing childlike innocence. Teddy bears at the centre of Flame’s composition invoke images of childhood. Motifs of positivity ring throughout the canvas. 福 (blessing; good fortune) connects to the portrayal of a blue-flamed soul with a golden chain. Rainbows leak out from the stuffed animals’ wounds, extinguishing the fires summoning hell. The pure untainted soul has prevailed over a battle; swords stab the shadowy figures below. 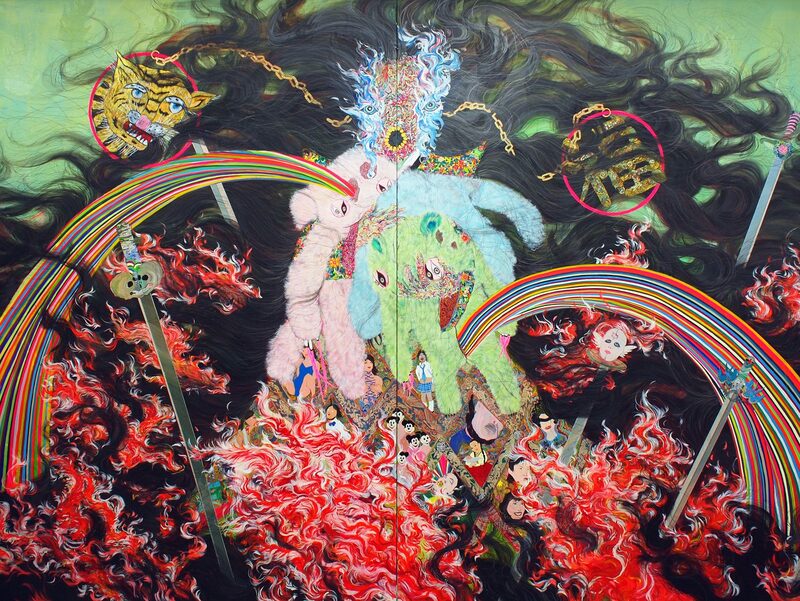 Superstitious images displayed in this painting underscore the overarching relationship Hyon Gyon has with notions of the spirit world in shamanistic practices. The visual incarnations of soul, spirit, and demon relay their salient presence in her own worldview; perhaps these entities are lucid and close at hand. Hyon Gyon, Hello! Another Me, 2011-2012, Acrylic and Japanese paper on panel. Image credit: © Hyon Gyon, courtesy of g³/ gallery. Photo by Rui Mizuki. Hyon Gyon’s use of iconography as a way of referencing her South Korean childhood is palpable in her work, Hello! Another Me. She deals with grief felt collectively by families after a recent bereavement. Vague figures characterised by the hanbok, a traditional Korean dress, are unified by a thick black hair which engulfs material objects specific to Korean and Japanese cultures. Small images of uniformed schoolgirls and Korean beauty pageant contestants hang from the hands of unidentifiable bodies wearing hanboks in a votive manner. They are held as prayer beads are often held. A demon with words such as the Chinese 必 (essential) painted onto its horns presented alongside a colourful skull attributes the necessitated presence of death amongst life. We Were Ugly conceives imagery of demons, skeletons, and the evil eye in 17 large-scale panels displayed in a contemporary space. The empty space of the gallery leaves plenty of room for the viewer to contemplate the niche-ness of Gyon’s art. The painting seems to exist somewhere between a two-dimensional and three-dimensional state. It retains sculptural elements while still utilising the flat canvas as its vehicle for expression. It renders neon pink, acid greens, nacreous textures, ripped textiles, and glittering surfaces in undulating waves. Gyon’s brushstrokes are rhythmic, incised with a knife to accentuate the hollows and bulges of the painted surface. The artwork itself is more like a relief work: impasto layers of paint and other less conventional materials are so thick, the bottom of the canvas no longer seems relevant. Much like a bed of coral, many textures are brightly coloured, piercing, and sharp. Others are soft and membranous in their bulbous protrusions. Cavities in the paint surface reveal caves of glowing gemstones crafted from glitter and seared oil paint. Variations in textures create an organic form, vaguely comparable to the body of Disney’s 1951 version of Absolem, the caterpillar from Alice in Wonderland. This organic aspect of the painting adds a sense of familiarity. It is a source of comprehension in a world made remarkably alien. Appropriating elements of Abstract Expressionism into the sweeping compositions of her paintings, We Were Ugly envisages a portrayal of Gyon’s internal mind in an organically iridescent, yet jarring manner. Hyon Gyon, I Lived Well, 2016, mixed media, dimensions variable. Image credit: © Shin Gallery and Hyon Gyon. I savoured the visual articulation of East Asian symbolism in her work; I revisited the superstitious practices I so often encountered throughout my childhood. Death is often palpable in Chinese superstitious celebrations of ancestors and their spirits. In the Taoist and Buddhist traditions of certain Asian countries, an entire month of every year is dedicated to producing offerings to ghosts who cross over from the spirit world during this period. As I was growing up, New Year’s days were spent setting off firecrackers to exorcise evil spirits who apparently dwelled in our home. I witnessed these practices and related dearly to Gyon’s articulations of ritual and artistic performance as a way of comprehending death. In a nostalgic and arresting way, Hyon Gyon’s artworks are powerful. They activate childlike experiences of life in one’s own imagination, while also serving as reminders that death and decay remain close at hand. Gyon calls upon us to meditate on the way we process the trauma and realities of death. Her paintings are profound, obsessive, staggering, and above all, incandescent. 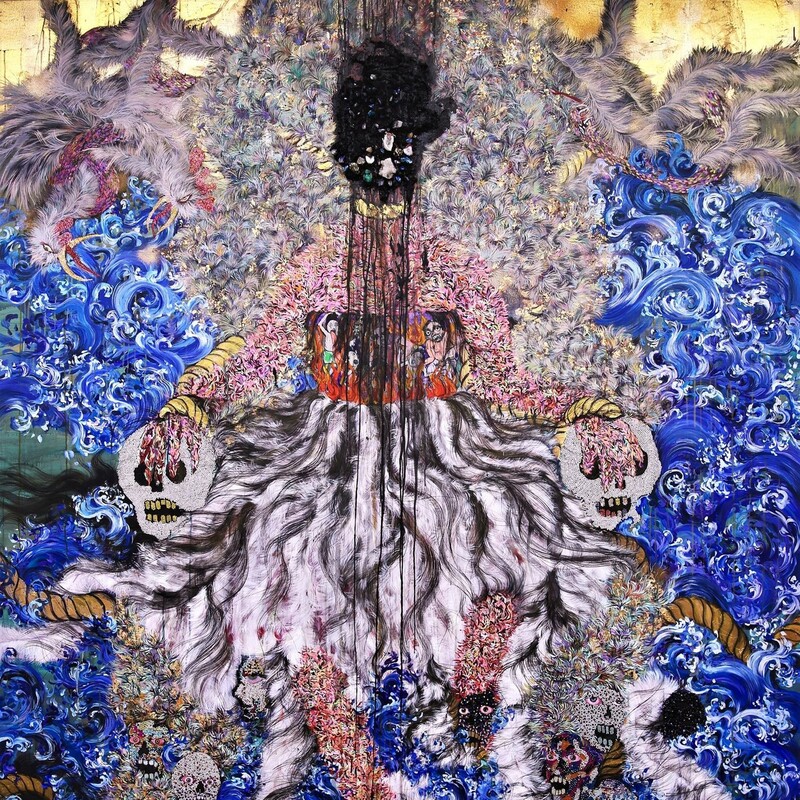 Featured image: Hyon Gyon, Mother, 2014, mixed media on panel. Image credit: Parasol Unit Foundation and The Great Britain Sasakawa Foundation. Hyon Gyon’s solo exhibition at the Parasol Unit Foundation for Contemporary art is on exhibition from now until the 31st of March 2019. More information may be found here.